Ahh, yes. The fireplace. There are few things cozier than a crackling fire in your living room while you’re bundled up on the couch with a good book. There’s just one (potentially) teeny, tiny problem with this scenario: fireplaces are one of the most energy-inefficient and possibly dangerous features you can have in your home. Like your home’s HVAC system, maintenance is critical to both function and safety. 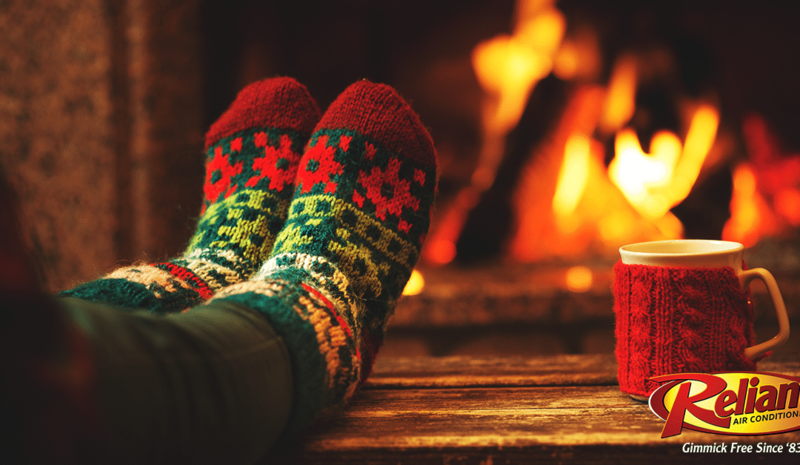 If you intend on using your fireplace as a supplement to your home’s furnace, Reliant Air Conditioning is here to provide you a few facts, tips, and tricks before you light things up. For starters, learn before you burn. A fireplace can force nearly 1,500 cubic feet of your home’s air per minute – precious warm air that your furnace just worked hard to heat up. The result? A shockingly high energy bill. (Don’t say we didn’t warn you.) Also, the fact that warm air is escaping means cold air is also entering your home. Sure, things may feel nice and toasty if you’re close to the fire itself. The rest of your home? Well, we hope you’ve got some good socks. That’s not all, folks. Gas fireplaces are trending over wood-burning ones these days not only for the fact that they’re easier to operate (and don’t require a steady supply of wood) but also because they’re safer. Without fireplace maintenance, a toxic substance known as creosote builds up inside a chimney, frequently resulting in disastrous house fires. You can identify it by its nasty, dark, tar-like appearance. The most important thing to know about creosote is that it’s highly combustible. Do not – we repeat, do not – operate your fireplace if creosote is present. If you suspect creosote, you’ll want to call in a professional to take care of the problem. Then there’s the air quality issue. First of all, dense smoke should not be present while operating your fireplace. If you notice smoke or experience a seriously gag-worthy smell coming from your fireplace, that’s a problem. You definitely don’t want any toxic smoke or fumes in your home, so know that these issues are totally preventable with proper chimney maintenance. Yeah…that’s not supposed to be there. You’ll want to have that cleaned up, stat. All of this being said, might we recommend something a bit more…natural. Natural gas-driven, that is. A gas fireplace won’t heat your entire home (unless you’ve got one of those tiny houses we keep seeing on TV, then maybe) but it can provide an energy-efficient way to heat a room that’s occupied for an extended period of time. If you want to turn down the heat throughout your entire house knowing that you’ll be spending a long day watching, say, football, you can stay nice and warm while saving money on your overall bill. In conclusion, when you give us a call for your fall tune-up, don’t forget to call the chimney guys, as well. We seriously love our customers here at Reliant Air Conditioning, and we want you all to be safe this season. If you find yourself in need of furnace repair, heating repair, or heating service, Dallas – Reliant will be on the scene. Click HERE to contact us about HVAC maintenance before the cold months really arrive (and they’ll be here before you know it).